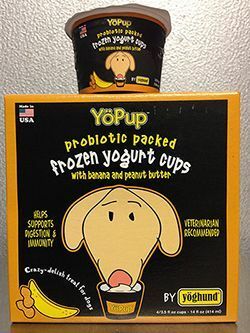 Real frozen yogurt for dogs, with billions of special probiotics added per cup, for real health benefits! The dairy product dogs SHOULD add to their diet everyday. 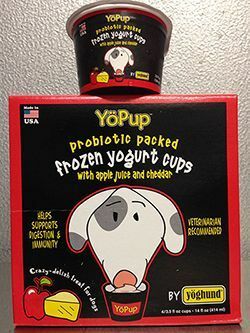 Yöghund, frozen yogurt treats-just for dogs, are manufactured in New England by a dedicated and knowledgeable team of dog lovers. Yogurt is a well-known 'superfood', that is extremely nourishing and contributes to overall wellbeing. Yöghund adds billions of live cultures that are benficial to dogs, in 6 additonal strains, per cup, to the existing yogurt base. Freezing these treats keeps these live bacteria safe and viable, so they can jump into action in your dogs tummy. Introducing billions of desirable probiotics, ensures enough will survive the challenging digestive process to take up residence in the lower intestines. Here they do their work of aiding digestion and nutrient uptake and supporting the immune system. Watch this video from Yoghund on the benefits of the probiotics in their products!